It started on December 20 with an inch of cold rain, much of which turned to ice. What didn’t turn to ice turned to mud. On the morning of the 23rd, the snow began. It snowed all day and all night, and on Christmas Eve day, we had ten or twelve inches of wet snow on the ground. The Kiowa and Comanche, who once inhabited this country, had mastered the discipline of sitting out a bad day. They sat out the whole winter. They loved to fight and hunt, but only when the weather was decent. Come winter, they went to the house, put away their weapons, and sat around the fire until the snow melted and the north wind lost its sting. We have no record of what the wives thought of sharing a tent all winter with idle males who didn’t believe in cooking, washing dishes, or cleaning up messes, but aside from the marital strife it might have caused, it was a sensible way of approaching life. Work when the weather suits you. When it doesn’t, hole up and wait for a better day. I have never known a rancher or cowboy who could say those words, much less put them into practice. We seem to be driven by some compulsion to answer the challenges Mother Nature throws at us. The worse the weather, the stronger the compulsion. 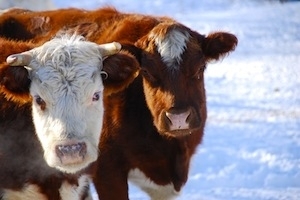 One day in the 1979, when I was working on the LZ ranch, the boss and I set out to feed cattle on a day that would have seemed miserable even in Fairbanks, Alaska: howling wind, blowing snow, and a chill factor of 35 below zero. It was a perfect day to stay home, but we didn’t. We spent all day trying to feed cattle who were smart enough not to care whether they got fed or not. I remember thinking that this was crazy. I had the same thought one frigid day last winter when I was feeding my own cattle, and couldn’t blame Lawrence Ellzey for being there. And I had the same thought last night when Mark and I finally made it to the house at dark, half-frozen and exhausted. We had set out to feed the ranch at nine o’clock in the morning. At the end of the day, we had succeeded in getting hay to a few cattle in the Mesa Pasture and had fed the horses in Picket Canyon. In the East Pasture, we put out hay for 96 cows, only they didn’t bother to come eat it. We never made it to the West Pasture. We had burned a tank of diesel in the dozer and half a tank in the pickup, and we had managed to get the four-wheel drive pickup stuck five times. Our clothes were soaked, the pickup was encased in frozen mud, and our boots were covered with a layer of alfalfa leaves. For all that, what did we accomplish? Not much. Will that keep us from doing it again next week? Probably not.